Are you operating as an auto dealer in Illinois? You will need to meet a new bond requirement to stay compliant as of January 1, 2018. Car sellers will have to obtain a $50,000 Illinois auto dealer bond instead of the previously required $20,000. The new bond amounts are introduced with Senate Bill 1556, which came into force in August 2017. The surety bond is one of the main licensing requirements for dealers. Only after getting proper bonding you can be allowed to operate legally in the state. What do you need to know about the changes in the new bill? The new legislation changes the amount of the designated agent bond for Illinois dealerships. All dealers have to post a bond when getting licensed with the Illinois Secretary of State. As mentioned, it is increased from $20,000 to $50,000. This amount is needed for every business location that you’d like to run. You have to use the official Designated Agent Bond Form. In case you are getting licensed and bonded before the end of 2017, it is recommended that you request the higher bond amount now. In this way, you will avoid obtaining a bond rider after January 1, 2018. Additionally, the bill increases the minimum bond amount for remittance agents, who are in charge of taxes and fees collection from car sales. Now agents have to post at least a $20,000 bond, instead of $10,000. Depending on remittances in the previous calendar year, the bond amount may also be higher. Every time you renew your Illinois auto dealer bond, you can work on lowering your bond cost. The bond premium you are assigned depends on the bond amount you need to post, but it is also calculated on the basis of your personal and business finances. Even though you now need to obtain a higher bond amount – $50,000, your bond premium doesn’t necessarily need to be much greater than your current one. If you take steps to improve your credit score and cover any outstanding payments, you can present yourself as a more stable bond applicant. This can significantly decrease the price you have to pay to get bonded. Apply for a free no-obligations quote on your Illinois auto dealer bond! 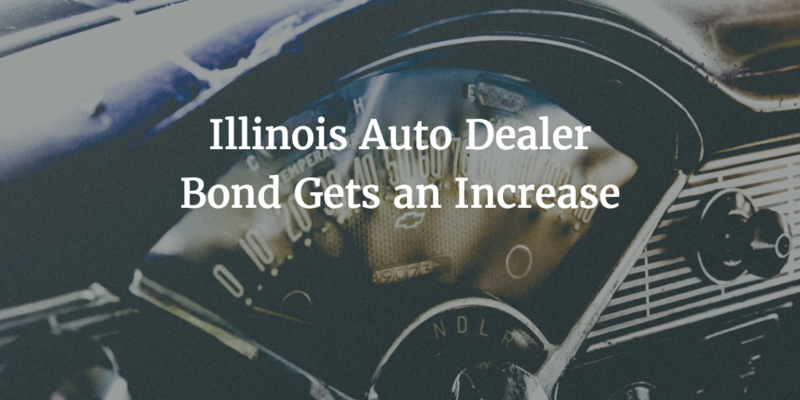 Need more information about the Illinois auto dealer bond increase and your bond application? Don’t hesitate to reach us at 877.514.5146.